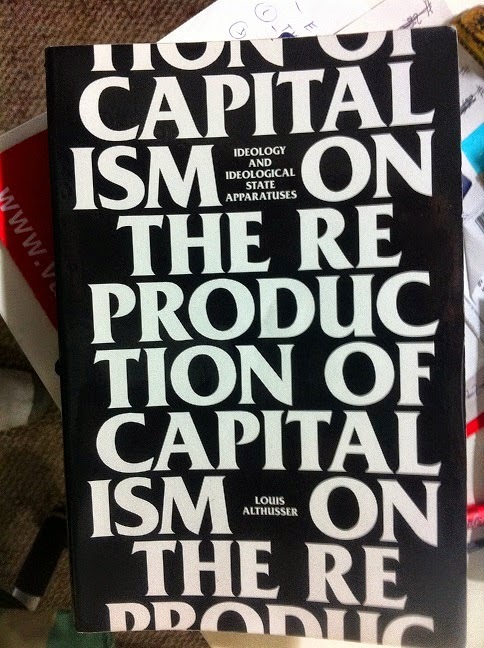 In his book On the Reproduction of Capitalism: Ideology and Ideological State Apparatuses, Louis Althusser expounds his ideas on capitalism with its daily operations and functions, while highlighting Marxist theory in its revolutionary purpose to overturn the capitalist way of life. For the most part (with the exception of occasional philanthropy here and there), virtues like compassion and empathy are incompatible with the notion of capitalism. In a sense, Althusser may be right that capitalism means exploitation of the workers. It must be so because capitalism is about money and profits. If you have the capital to purchase land or a business, you can hire people (labor) to work for you; in exchange you give them money or compensation for their work and time (a wage). The lower the wages, the higher your gains. There is then no wonder that minimum wages work on bare minimums, meaning people barely make enough to get by. However, in order to ensure the continuous existence (or reproduction of relations) of capitalism, people need to be imbued with the idea that capitalism despite its glaring greed and injustice is actually fair and beneficial for everyone involved. This (false) impression is created in a number of ways, primarily through the ISAs (Ideological State Apparatuses). In fact, according to Louis Althusser, pretty much any ideology one can think of could be summed up under the umbrella domain of one and the same state ideology. For Althusser, ideology is material and for the most part it serves the state and the continuing exploitation of the dominated classes, i.e. the working class. For example, the church is more often than not in line with the bourgeoisie as this particular economic and political system and relationship benefit the clergy (and their pockets) quite well. This has been done throughout history when the Catholic Church supported worldly leaders, kings and emperors. Although religion still has a stronghold on people today, the functions of the church have been mostly replaced by the educational state apparatus. Schools are to ensure that both discipline and respect for authority and for the law are instilled and drilled at an early age. These ideas are taken up and propagated by the family institution as well. By having people obey the given rules, it is mainly the capitalist system that reaps benefits as there is little disruption to its functioning. In case of possible trouble or conflicts, there is always the law. The law, Althusser believes, is a capitalist creation of the bourgeoisie which under the guise of liberty and equality mainly benefits a select few, namely the rich. It is the wealthy that have the power and access to circumvent law through loopholes and other means. In the meantime, the rest of the populace take laws to be fair and just and equally accessible to everyone, ideological lies that are served to the masses. If the law is not followed by the masses, the repressive state apparatus with police, riot force and ultimately the military are called in to ensure that it is followed to the letter. Yet that is the exception not the norm; for the most part, people are taught to respect the law so that it becomes internalized and such disruptions can then be avoided with preventive and preemptive manners. For example, most people follow the law and believe in its intrinsic value, that it is a moral and right thing to do. In all those instances, the ideological foundations of the person make the use of force both redundant and unnecessary in most of everyday life. However, at certain times where there is open defiance and revolt, for example the May '68 events that were occurring during the time Althusser was writing this book, the riot police and military need to ensure that the capitalist system is not endangered or injured in the process. According to Communist ideology a successful revolution ought to ensure that the bourgeois state apparatus is completely destroyed and replaced with a new kind of system (Althusser seems rather vague on what and how this new system should or would look like). This type of overturning the state had occurred only partly during the French Revolution because the bourgeoisie managed to take control over the state. They had successfully disposed of the aristocracy but now the bourgeoisie themselves, the growing merchant class, began to call the shots and to oppress the workers, the proletariat. There are some fascinating bits in this book. Althusser's discussion of ideology and the state apparatus are interesting, timely, and relevant in a number of ways. It must have had some influence on works by Noam Chomsky, especially his Manufacturing Consent. We can see it today since people are constantly brainwashed by media, sports, and politics, not to mention culture and religion, all of which have parts and components that benefit the ruling class, the capitalists. I was most impressed with his discussion of individuals and subjects. Althusser claims that we are all subjects and have lost our individual freedom and autonomy contrary to what we may think in the Western world. Subject, in fact, is an ambiguous term, which could alternatively mean either a person who acts freely and of his own accord (as a noun) or its exact opposite, that is, a person who is studied or is following enforced rules and regulations he is subjected to (as a verb). Althusser claims that we are subjects even before we are born, as we are born into a family that has expectations and preconceived notions about us and our gender. In fact, we are passive from the onset since our names are chosen and given to us by others. Add to that cultural and religious practices and the ensuing years of schooling, and we can see that we are greased cogs in a capitalist machine. In fact, Althusser gives a brilliant explanation of religion, which is to him an ideology that subjects all of us. Any ideology presupposes that we recognize ourselves in them (otherwise they would be quite useless). So, for example, me, that is my name and all the properties attached to what makes me who I (think I) am, would recognize myself as being a Christian. This is followed by a number of highly ritualized practices, such as baptism, going to church, praying etc all of which makes me - or rather is supposed to make me - a good Christian. But all of this occurs and is done because it is seen as relevant to me and my life. That means that there is a guarantee that I will personally benefit from this particular ideology I have espoused and the belief or faith that this is indeed true, that, for instance, God actually exists and will reward me (after my death!) for my continuous efforts of being a good Christian. In that sense, God would be the Subject that is dominant over all his subjects on this planet. It would mean that God would need humans who are created in his image. This would make him as dependent on us as we are on him. God could not be God without being recognized as God by us humans. In other words, he needs us and he is, in fact, able to put up with our unruly and sinful behaviors because it is better than nothing. (This could be why he saved Noah and his family from the Flood, out of basic necessity not out of compassion or love). Evidently, there is a touch of Hegel in here, especially regarding his ideas of God (the Father) bridging the gap between the divine and humans by “duplicating” himself as a human, Jesus (the Son), who is both man and God, while the Holy Spirit is the mirror-connection, image or glue between the two. All this is fascinating and makes the open-minded theists scratch their head. Yet I do have some bones to pick with some of Althusser's ideas. First off, he as well as Communist ideology in general rather seem vague on a number of points, especially when it pertains to what the new state ought to look like. It is like a doctor describing the symptoms quite well without knowing how to cure the disease. In fact, it seems that Communist governments have been copying or reproducing the bourgeoisie, particularly in terms of state apparatuses; Communist regimes have come to control and master them rather perfectly as the self-appointed "dictators of the proletariat." So the ISAs may be the same or even worse operating under different names and ideologies. Secondly, I do not fully share his view on education. I believe I am justifying or representing my own role as an educator here, but I intrinsically believe that education and knowledge open the mind. Of course, education is a broad concept, and there are qualitative differences, but education is overall a means to achieve self-knowledge and freedom because it ideally leads to critical thinking. At least that is my view on what education is or ought to be. Thirdly, I do not believe that human rights and ethics and even philosophy are all enslaving us to capitalist ideology the same way I do not think that churches necessarily represent true faith. These are, in and of themselves, very worthy and noble ideas and traditions that are unfortunately being used (or rather ab-used) by the authorities to cement their own power and influence. But to claim that ideology per se is an illusion - and hence false - is not something I can accept, which is the main reason I consider myself an idealist not a nihilist. But I thoroughly enjoyed this book and want to thank Verso Books for publishing such thought-provoking and -inducing works and for also sending it to me for review. This review took me a long time to write (sorry!) because the weighty ideas expressed in them take sufficient time to digest, but this book is definitely worth your time, effort, and yes your money. Capitalism certainly is receiving a bad rap these days. There is a certain community that knocks capitalism for oppressing the masses. Another that blames capitalism for fostering greed and excess. Another that attributes climate change to the excesses of corporations. Or for squelching human creativity and freedom. In certain communities the word 'corporate' has become a negative term. An insult, as in "Oh you're so corporate." It's a good thing that we have alternative forms of organizing our economies, such as communism or feudalism or colonialism or hunting and gathering, all of which are entirely free of the vices of capitalism listed above. Could it be that these vices are actually weaknesses of human beings - and that capitalism - along withcommunism or feudalism or colonialism are merely tools? If a carpenter builds a house that falls down, should we blame the hammer? Thank you for your comment, and you make some interesting observations here, dear Commerce Instructor. Initially, I was planning to present my own views of how capitalism ought to work in an ideal society, but somehow the post would have gotten too long and rather unfocused. The focus here is mainly the great book by Louis Althusser; mixing them too much with my own ideas would have not given this French thinker enough space and justice. So I will expose myself more clearly in due time. For now let it suffice to say that the main problem here is not capitalism per se, but it is its greed. Capitalism works great for those who have the CAPITAL, let's call them the Haves, and not so great for those who don't, the Have-nots. That the former are responsible for a host of problems and ills in the world is beyond doubt and discussion here. Yet that does not mean that the capitalist system is necessarily wrong nor does it mean that (God forbid) communism would be the best form of government. Far from it actually as I have mentioned somewhat in this post and in others as well. That this could be an inherent human flaw I agree with however. Greed is human, yes. But it is at its basest and crudest form. Put differently, we can do much better than that. If one were to say that laziness, another human flaw, is why communism does not work since those who do not work would get similar benefits as those who do (which is not fair), I would also agree with that statement. What we are left with in the end is a sort of cliffhanger until further notice. In the meantime, commerce (and other) instructors need to teach and make money; such is life. I think we are in agreement. Greed - and other human failings - is the problem, rather than any of the economic systems. All economic systems have their strengths and their weaknesses. But what matters most is how they are applied. I recall that the former Soviet Union had a constitution which, on paper, was idyllic. In practice, it didn't work as well.